Grilling Season 2013 is here!! Yea!! I was so happy a couple of weeks ago to clean off my grill and get it ready. I had a friend over for dinner and made my BBQ Bacon Wrapped Shrimp. Yum. There is nothing that compares to that black char on grilled food. Do we salivate because some primeval part of our brain is triggered by genetic memories left over from our hunter-gatherer forebears? We have been flaming our food for about 500,000 years after all. Whatever it is, I am looking forward to a lot of grilled dishes in the next several months. Which I plan to share with you. I was thinking about some great burgers I want to try, and that brought me to the hamburger buns to go with them. Those soft buns you get at the market can be frustrating sometimes, especially if your filling is at all wet. The bun bottom gets wet, too, and ends up disintegrating and falling on your plate (or lap, usually mine.) So I figured this summer, I would make my own buns and they would have structure, so they wouldn’t fall apart. These hamburger buns are slightly sweet, but not overbearingly, and are a perfect foil for whatever fills them. And they’re easy. Just my kind of recipe. From start to finish they took about 6 hours, but there are a couple of one to two hour rising times, so you can clean your house or do your laundry. Just kidding. You could read a book, have a drink and watch a movie, or sit on the couch and makeout with your boyfriend. Just don’t forget that dough it is arising. Sorry about being so silly. I’m just excited about grilling season being here. First the warm milk, yeast and sugar are mixed and set until foamy. The flour and egg are mixed in until a shaggy dough forms. 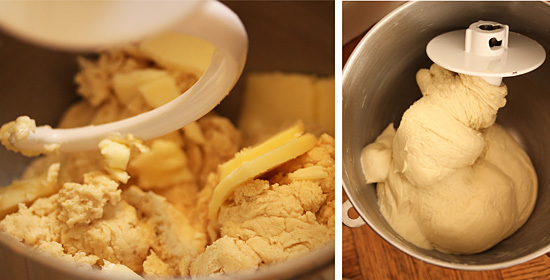 Butter is added and kneaded with the dough hook for about 8 minutes until it’s nice and smooth and elastic. Here you can see the dough before and after rising for about 2 hours. This is the part that always amazes me. That yeast is alive! 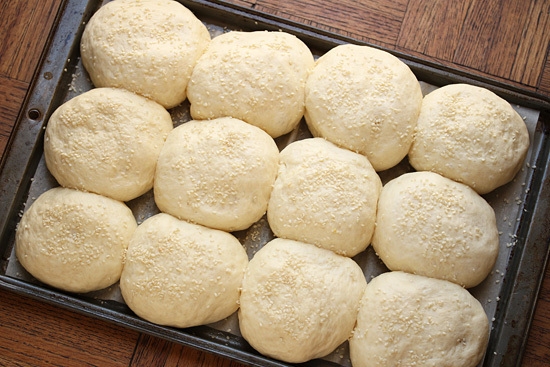 The dough is formed into a cylinder and cut into 12 pieces. They are formed into balls and flattened into discs about ½-inch thick. More rising for about 1 ½ hours. 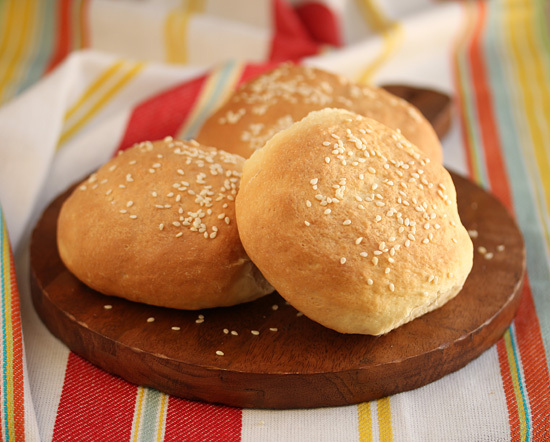 Now the buns are misted with water and sprinkled with sesame seeds. Almost done. Hang in there. Now is when they finally get baked and come out all golden brown and smelling heavenly. Oh yes. 1. 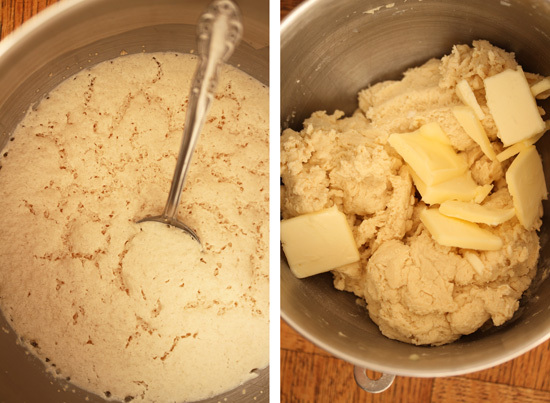 Mix the yeast, heated milk and 1 ½ teaspoons sugar together in the bowl of a stand mixer. Let sit for about 10 minutes until foaming. 2. To the yeast mixture, add the flour, 1 tablespoon sugar, salt and egg. With the paddle attachment, mix on low until a shaggy dough forms. 3. Add butter to dough and with the dough hook, knead on medium high for about 8 minutes until a smooth elastic dough forms. If dough travels up dough hook, stop and push it down off hook and resume kneading. 4. Place dough in buttered bowl, cover with plastic wrap and set in a warm place until doubled in size. This may take 1 ½ to 2 hours. I put my bowl in the oven with the oven light on and door shut. 5. Roll/pat dough into a cylinder about 18 inches long. Cut into 12 sections. 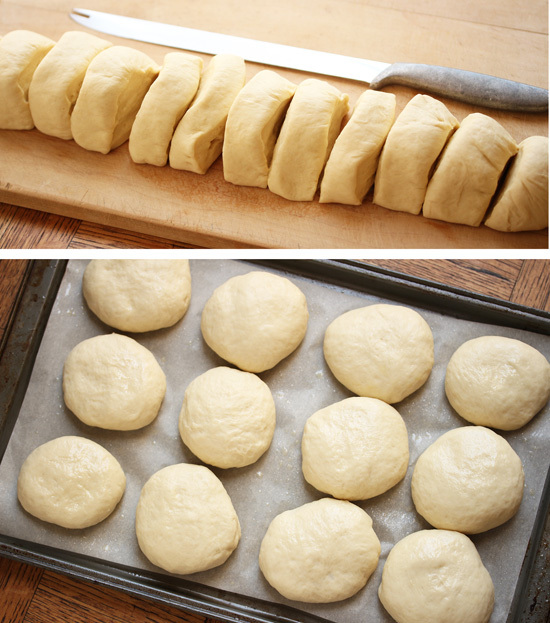 Make each section into a smooth ball by pulling dough down and under ball. Seal seam by pinching edges together. 6. With seam on bottom, flatten each ball into a disc about ½-inch thick and place on parchment lined sheet pan. Brush balls lightly with oil and cover loosely with plastic wrap. Let rise for 1 ½ more hours. I put mine back in the oven. 7. **Remove sheet pan from oven. ** Now preheat oven to 400 degrees F.
7. Remove plastic wrap and spray dough balls with water, enough to moisten, but not running off. Sprinkle each ball with about ¼ teaspoon or more sesame seeds. 8. Bake for 16-18 minutes, rotating once, until golden brown and hollow-sounding when rapped. Cool on rack on parchment paper. Note: If bigger buns are desired, cut into 8 portions instead of 12 before forming balls. Those are perfect! I usually eat my hamburgers wrapped in lettuce (how utterly boring) but, after seeing your creation, I am going to try making buns instead. I’ve made buns, but they come out so dense. I guess I wasn’t letting them rise enough. Must remedy this in the future! 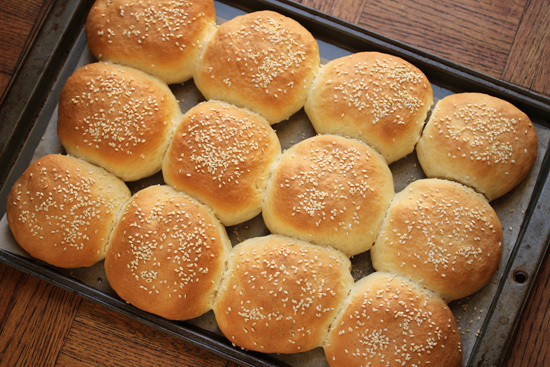 I’ve always wanted to make hamburger buns. I feel now I don’t have to look very far for a good recipe. These buns look just as soft and delicious as you have described them to be.